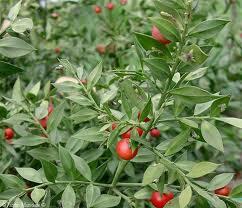 Ruscus aculeatus was used for scrubbing butchers' blocks, cleaning chimneys, repelling rats and mice. It was also used extensively in medieval folk medicine for a variety of ailments; too many to mention here and not recommended by the writer! This is a clumping evergreen shrub that thrives in the shade. It has white flowers that appear in autumn/winter, followed by red berries. This plant is ideal for those areas of the garden that rarely see the sun. Foliage lasts well when cut and used for flower arrangements.